So, its been kicking around in my head for a while that I should look into this whole business of fermented vegetables. I’ve been hearing that they’re a great non-dairy source of probiotics, can help with sugar cravings, and are great for digestion. All I know is that whenever my gut is going haywire, fermented foods seem to help quite alot to calm it, and reduce swelling, which was terrific. So, I went hunting around trying to find some easy recipes. I noticed that alot of different recipes called for exotic types of vinegars (plum vinegar) and rice wine and things that at the moment are simply not part of my grocery budget. I thought back to the foods that my aunts in Italy used to eat all winter, like Giardiniero (winter vegetables), green beans, all manner of just about anything pickled you can think of. I figured, it couldn’t be that hard! I mean, I must have the ingredients already in my pantry somewhere. And then I came across this lovely blog called the Raw Foods Witch. (its kinda cute I must say). She has a super, super simple recipe for fermenting vegetables that I tried 3 days ago, and this morning, I opened the jars and voila! It worked!! 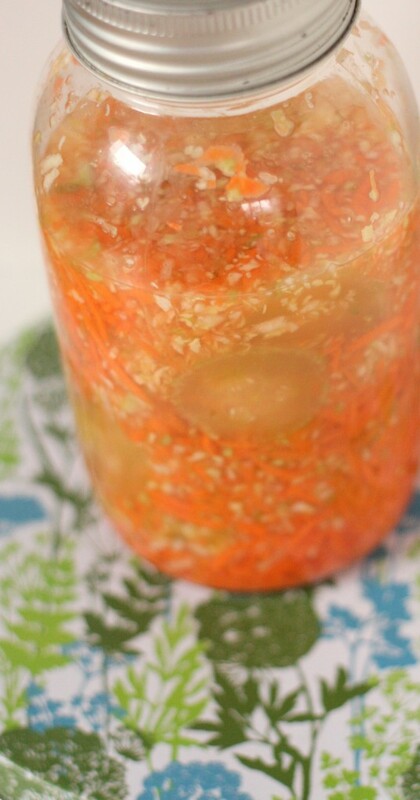 If you aren’t so sure, check out her great entry on the benefits of eating fermented foods. Now, if you want to expand your repertoire to non dairy coconut kefir yogurt and coconut water kefir– you totally have to check out Heather at YumUniverse. Those look terrrrific. Make the brine: dissolve the salt in the water completely. (This is important as it prevents rotting). 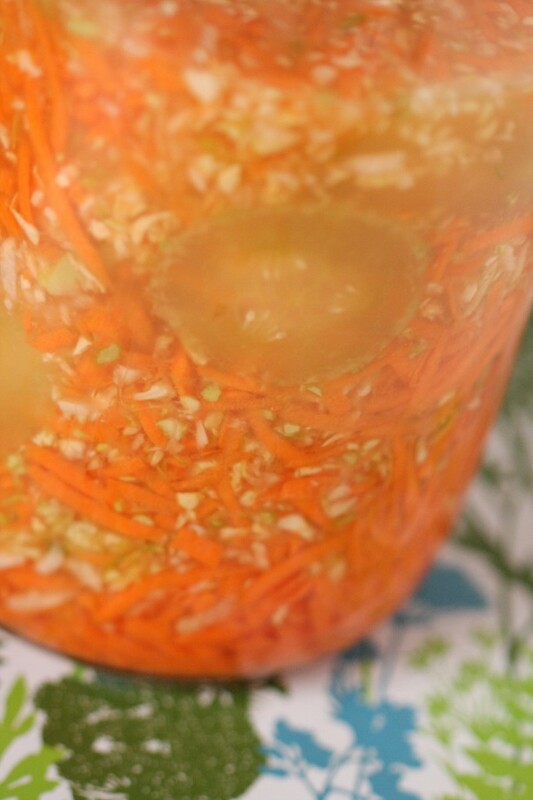 Chop or shred your vegetables and add them to the jar with brine in it. Make sure that the brine covers the veggies completely. Weigh down the vegetables to keep them covered- I used a smaller lid and pressed it inside the jar before putting the regular lid on. Let sit for 3 days. Once a day open the top lid for a few minutes to release gas or else your jar may crack. When its done (on the 3rd day), refrigerate. Yup, thats all. Eat with just about anything- as a side or pour some of the juice into your soup for a probiotic punch. I don’t think I can get distilled water around here… wondering if filtered water will work.